The world outside America is used to staying up all night to watch the US presidential election. The midterm elections, however, are not normally regarded as a global event. But this time is different. The results of the 2018 midterms will be seen all over the world as a crucial test of whether Donald Trump has permanently changed America. The stakes have not been higher in a generation. If the Republicans do well, then many will conclude that “Trumpism” is here to stay. The rest of the world would have to make a long-term adjustment to an America that is highly protectionist and suspicious of treaties on principle — whether they deal with climate change, arms control, refugees or migration. However, if the Democrats prosper on Tuesday night, then the US president’s foreign critics will cling on to the hope that the Trump years may yet turn out to be an aberration — and that the old America is waiting in the wings to return. Countries that have been targeted by sanctions or tariffs by the Trump administration — such as Iran and China— will be keen to see the president receive a bloody nose at the ballot box. It is unlikely that significant Democratic party gains would be enough to resurrect the Iran nuclear deal or to roll back tariffs on China — not least because many Democrats also lean towards protectionism and are hawkish on Iran. But a big political setback for the president would weaken the sense of momentum behind the Trump agenda. There will also be some traditional American allies that are quietly hoping for big gains for the Democrats. The EU, as an organisation, has struggled to come to terms with the fact that Mr Trump is the first ever US president who seems hostile to the very idea of European unity. In part, this is because Mr Trump objects to the trade surplus of more than $100bn that the EU enjoys with the US. He also regards low levels of European defence spending as freeriding on the American security guarantee offered through Nato. But there is also an ideological element in Mr Trump’s hostility to the EU that concerns officials in Brussels, Berlin and Paris. The US president likes to denounce “globalism” — a term that he and his aides use to describe the encroachment of supranational institutions on national sovereignty. But the EU is the world’s most successful “globalist” organisation, since its organising principle is the creation of international laws that limit the sovereignty of national governments. Ulrike Franke, a policy fellow at the European Council on Foreign Relations, says European policymakers are also concerned by evidence that support for alliances is becoming a partisan issue in the US. She cites a Pew Research Center poll earlier this year which showed that only 36 per cent of Republicans think the US should take into account the interests of allies, if that means making compromises. By contrast, 74 per cent of Democrats think that taking allied concerns into account is important. Concern about the Trump administration’s attitude to allies is shared by many other traditional American friends. Canadians were stung that their country was labelled as a “national security threat” to the US, to justify the imposition of sanctions on steel and aluminium. The government of Justin Trudeau was put under tremendous diplomatic, economic and rhetorical pressure by the Trump White House during the renegotiation of the North American Free-Trade Agreement — something that will be long remembered in Ottawa. But there are also a considerable number of governments that will be hoping for Republican success in the midterms. Mr Trump’s period in office has given a shot-in-the-arm to nationalists and cultural conservatives around the world — several of whom are now in power. These governments will be hoping for a big Republican victory, to confirm that they are on the right side of history. Mr Trump’s cheerleaders will include Jair Bolsonaro, the newly-elected president of Brazil, who said during his election campaign that — “Trump is an example to me . . . and in many ways to Brazil”. Even inside the EU, there are nationalistic and populist governments that see Mr Trump as an inspiration — including Italy, Hungary and Poland. The nationalist and culturally conservative government of Poland is facing disciplinary proceedings from the rest of the EU for violations of the rule-of-law. But the Polish government has cultivated a special relationship with Mr Trump’s America. Warsaw was the location for his first big speech in Europe and Poland was one of four countries named in a special shout-out in Mr Trump’s recent UN address. The other three were India, Saudi Arabia and Israel — and each of these governments have their own reasons for looking favourably on the Trump administration. The Netanyahu government in Israel was delighted that Mr Trump delivered on his promise to renounce the Iran nuclear deal, and to move the US embassy from Tel Aviv to Jerusalem. The Saudis have also welcomed the Trump administration’s much more punitive approach to Iran — and know that they are much more likely to weather the current row over the murder of the journalist Jamal Khashoggi with a friendly president in the White House. The Indian government led by Narendra Modi dislikes the US president’s protectionism. But it has appreciated the increased strategic importance that his administration has assigned to India, as America positions itself to deal with a rising China. This was symbolised by the US military’s decision, last May, to rename its Pacific Command (responsible for all military activity in the Pacific), as the Indo-Pacific command. The Russian government is one of the few administrations with a direct stake in the outcome of the midterms. If the Democrats take control of the House, there are almost certain to be congressional hearings on alleged Russian interference in the 2016 US presidential election— as well as an effort to impeach Mr Trump. Any such hearings could be embarrassing for the Kremlin, and might even lead to further economic sanctions on Russia. Despite Moscow’s eagerness to see Mr Trump elected in 2016, his administration has been something of a disappointment to the Putin government. Indeed the US has intensified economic sanctions on Russia and expelled Russian officials in the wake of the poisoning of Sergei and Yulia Skripal in the UK. Recently, Mr Trump even announced America’s intention to pull out of the 1987 Intermediate Nuclear Forces arms reduction treaty. Nonetheless the Putin government has not given up on Mr Trump. Alexander Gabuev, a senior fellow of the Carnegie Endowment in Moscow, says he thinks “Putin’s preferred outcome” would be for the Republicans to maintain control over both the House and the Senate, giving Mr Trump more scope to push agreements with the Kremlin. The expectation of a potential second term for Mr Trump is also rising in Russia. There is also a group of governments that will be either neutral or simply confused by the current American political scene and the midterms. These neutrals include — for rather different reasons — Britain and Japan. Brexit Britain is sometimes regarded as a natural ally of Mr Trump’s America. But the government of Theresa May has opposed many of the controversial positions taken by his administration on a range of issues, from climate change to Iran. Early British hopes that the US might be amenable to doing a swift trade deal with the UK have also faded as the protectionist nature of the Trump administration has sunk in. On the other hand, the White House is, at least, rhetorically committed to the idea that Brexit is a good thing — while the Brexiters have never forgotten or forgiven the dismissive attitude of Barack Obama towards their pet project. The Japanese prime minister, Shinzo Abe, has done his best to build a special relationship with Mr Trump. But the Trump administration has delivered a series of snubs to Japan. On his first day in office, Mr Trump pulled America out of the Trans-Pacific Partnership, a large trade deal that Mr Abe had championed. And Mr Trump is still threatening Japan with big tariffs on car exports. Tokyo has also struggled to get its concerns factored into the president’s fast-evolving approach to North Korea. But despite all that, a conservative Japanese administration — such as that of Mr Abe — remains appreciative of the tougher US stance towards China. It is possible, however, that all of these governments are making a similar analytical error — by over-estimating the significance of the midterm elections. It is quite normal for a president to experience a backlash against their party in the first term, but that does not necessarily reflect a long-lasting shift in US politics. Both Mr Obama and Bill Clinton lost the midterms during their first term in office — but went on to win second terms as president. Losing control of Congress has a significant impact on a president’s ability to pass domestic legislation. But it may not change foreign policy all that much. The main impact of Congress in this area comes through its power to approve or reject trade deals and treaties. But since Mr Trump sees both trade and treaties as manifestations of “globalism” — he is unlikely to be pushing hard in that direction. Congress also has the right to vote on declarations of war. But unless there is some unexpected global crisis, the War Powers Act is unlikely to be invoked before the next presidential election. And Mr Trump has already shown that he is willing to use force at a lower level — for example by launching bombing raids on Syria — without seeking congressional approval. Even if the Democrats make big gains in the midterms and retake the presidency in 2020, the outside world might be wise to assume that elements of “Trumpism” are here to stay. The American left has also been moving towards protectionism for some time. Bernie Sanders, the left’s champion in the last presidential election, opposed the TPP — and forced Hillary Clinton to repudiate it as well, despite the fact that the Democratic candidate had championed the trade pact as secretary of state. Suspicion and even hostility towards China is also becoming a bipartisan trend. The last two years of the Obama presidency saw growing anxiety within the US military establishment about China’s increasingly assertive claims in the South China Sea. It was the Obama administration that stepped up “freedom of navigation” operations by the US Navy to challenge Beijing’s claims in the Pacific. Meanwhile Democrats such as Kurt Campbell, Mr Obama’s assistant secretary of state for Asia, have joined the chorus of voices arguing that US engagement with China has failed in important respects — and calling for a more confrontational policy. Although neither Mr Obama nor Mr Trump would care to acknowledge it, there are also important elements of continuity in their policies towards Europe and the Middle East. Robert Gates, secretary of defence to both Mr Obama and Mr Bush, made a landmark speech in Brussels in 2011 warning that US support for Nato would inevitably decline if European allies did not spend more on defence. Mr Obama was attacked by his critics for standing aside from the Syrian conflict and allowing US influence in the Middle East to dwindle. But Mr Trump has done little to shift this stance. His decision to authorise a missile strike, in response to the Assad regime’s use of chemical weapons, was a symbolic repudiation of Mr Obama — who had refused to take that step in 2013. But the Trump administration has made little effort to take a more assertive stance on Syria and continued to allow Russia to fill the military and diplomatic vacuum. Mr Trump has certainly adopted a much more overtly pro-Israel policy than Mr Obama. But, like all US presidents since Mr Clinton, he has been unable to change the underlying dynamics of the Israeli-Palestinian conflict. Meanwhile, America’s influence in the wider Middle East, while still formidable, continues to diminish. To some extent, this gradual erosion of America’s role as the “world’s policeman” is the product of conscious policy decisions. Mr Obama promised to concentrate on “nation-building at home”; Mr Trump has pledged to put “America First”. Both presidents were signalling, in their very different ways, that the US is tiring of the burdens of global leadership. That trend is unlikely to change — whatever happens in the midterm elections. The following is our cover story from this week print edition of DER SPIEGEL on events in Istanbul. This story went to print on Thursday night prior to the official statement by the Saudi Arabian government released on Saturday that the country's agents strangled exiled writer Jamal Khashoggi during a fistfight inside the Saudi Consulate in Istanbul. Saudi officials say that 18 men have since been arrested in connection with the case, including 15 men who had been sent to the consulate, along with one driver and two consular staff members. The statement was met with immediate sketicism from the international community. The Saudi government also dismissed Major General Ahmed al Assiri, the deputy director of Saudi intelligence, the deputy director of Saudi intelligence, who it claimed had organized the operation, and other intelligence officials. Doctor Salah Muhammed Al-Tubaigy is an expert with extraordinary skills. His specialty is the rapid autopsy. In an interview with an Arab newspaper, he once boasted that he could dismantle a corpse into manageable parts in record time. Tubaigy has had a storybook career within the Saudi state apparatus. After completing his medical studies, he opened one of the first research institutes for forensics in the Middle East. He now holds the rank of lieutenant colonel and heads up the forensic medicine department at the Interior Ministry. His task had been to bring research in Saudi Arabia up to Western standards. Now, he and 14 men have instead plunged the royal house into one of the most serious crises to face the country since the terrorist attacks of Sept. 11, 2001. According to the investigation conducted by Turkish police, Tubaigy landed on Oct. 2 at 3:13 a.m. together with eight Saudi Arabian secret service and military personnel in a Gulfstream IV jet belonging to Crown Prince Mohammed bin Salman at Istanbul's airport. Six other men arrived in the Turkish city a few hours later in a second plane. Security cameras filmed Tubaigy in a leather jacket and striped sweater as he passed through passport control. He checked in for three nights at a hotel located near the Saudi Arabian Consulate, but he actually left the city at 10:46 p.m. that same day. There are two versions of what happened in the 19-and-a-half hours between his arrival and departure. And whichever one is true, it is a crime thriller with details so gruesome and grotesque that a James Bond movie would pale by comparison. It is also one that has shaken the international community since that day. Saudi Arabian television has claimed that Tubaigy and his colleagues traveled to Istanbul as tourists. But that hardly seems credible given that the group flew back home only a few hours after arrival. The Turkish police, for their part, are convinced that the 15 men played a decisive role in the alleged murder of Jamal Khashoggi, a prominent opponent of the Saudi regime. He disappeared during a visit to the Saudi Arabian Consulate in Istanbul and has been missing since Oct. 2. Turkish investigators and intelligence officials believe they know what happened in those hours: According to their version of events, the commando squad from Riyadh waited for Khashoggi in the offices of the consulate. The men drugged and beat him. Then, while he was still conscious, they cut his fingers off. In the end, they claim, the men decapitated him. They say that forensics expert Tubaigy then unpacked the bone saw he had brought along with him. According to the Turkish investigation, he put on headphones to listen to music and recommended that people in the room next door do the same because it would make the work easier. He then dismembered Khashoggi's body. "It was like a Tarantino film," says one Turkish investigator. According to a report published in Yeni Safak, a newspaper loyal to the government in Ankara, Turkish authorities have audio recordings documenting the murder. Saudi Arabia's Crown Prince Mohammed bin Salman asserted in an interview with Bloomberg that Khashoggi had left the consulate after just a short time. But the prince has yet to provide any evidence to support that claim. Unfortunately, all surveillance cameras failed that day, though the manufacturer of the system swears that such a thing is not technically possible. The Saudi Foreign Ministry did not answer a request for comment from DER SPIEGEL. CNN, meanwhile, has reported that the government is preparing a new statement that will claim that Khashoggi died in an interrogation that spun out of control. The Khashoggi case is straining ties between Saudi Arabia and the West. It also poses a threat to the position of Mohammed bin Salman, who has been consolidating his power since his father, King Salman, appointed him crown prince in June 2017. Furthermore, the affair is a headache for U.S. President Donald Trump, who regards Saudi Arabia as one of America's most important allies in the Middle East. Privately, he also has close ties to the country, having completed several multi-million-dollar business deals with Saudi Arabians. And Europe is once again having to face the question as to how it wants to approach a country whose oil gives it massive influence over the global economy but which also blatantly disregards human rights. Until recently, it looked as though 33-year-old Mohammed bin Salman, often referred to by his initials MBS, could do whatever he wanted. The prince managed to wage a destructive war in Yemen, kidnap Lebanese Prime Minister Saad Hariri, impose a blockade on Qatar and lock up scores of opponents in Saudi Arabia without any consequences for himself or his regime. The Khashoggi case now marks a turning point. Fifty-nine years old at the time of his disappearance, Khashoggi isn't just anyone. He's the well-connected nephew of arms dealer and billionaire Adnan Khashoggi and the second cousin of Dodi Al-Fayed, the lover of the late Lady Diana. He was respected as a journalist around the world and has written for Saudi Arabian and international media, including DER SPIEGEL. He twice served as editor-in-chief of the Saudi Arabian newspaper Al-Watan, forced out both times because of his critical reporting. Early in his career, he sympathized with the mujahedeen in Afghanistan and visited Osama bin Laden, who later became the head of al-Qaida. In recent years, he has turned to liberal ideas and criticized radical Islamists' strict interpretation of Islam. Khashoggi was a big man -- literally too big for the thobe, the white, ankle-length men's robe traditionally tailored tightly in Saudi Arabia. He was tough, energetic, impetuous. In places where he turned up, people stopped and asked him for autographs and selfies. Khashoggi almost always agreed. He felt comfortable among people, and he spoke a simple, modern language. The severity and aloofness of Riyadh's elites were alien to him. He cracked jokes about the "bullfights" in the royal house in Riyadh and the beauty mania of women of Jeddah, but also about himself, the man who explained Saudi Arabia to the world. Few other journalists are as networked in Riyadh's centers of power as Khashoggi was. He knew about the alliances and the competition between the princes -- and, for a long time, he knew how to move safely under the protection of changing patrons. He set up a television station for Prince Alwaleed bin Talal, who is today the richest man in the Arab world. And, most importantly, he long served as an adviser and confidant to Prince Turki al-Faisal when al-Faisal headed the secret service. Khashoggi also saw opportunities in Mohammed bin Salman's rise. He initially thought the prince might modernize the country, but he soon grew alienated by bin Salman's authoritarian streak. In his articles, he denounced bin Salman's policies, especially the military operation in Yemen and Saudi Arabia's close partnership with the Trump government. After friends were arrested and he was banned from publishing stories in Saudi Arabia, Khashoggi fled to the United States last fall. "Since MBS has been crown prince," he recently told DER SPIEGEL, "there has been immediate and quick retaliation." He paid a price for his rebellion. His wife filed for divorce and relatives cut off contact with him. But Khashoggi refused to remain silent. "I can speak when so many cannot," he wrote in one of his columns for the Washington Post. It is said that the royal house once again reached out its hand during the summer and that intermediaries made an offer for Khashoggi to return to Saudi Arabia as an adviser to MBS. He turned them down. Is that the decision that sealed his fate? British author John Bradley, a longtime friend of Khashoggi in Saudi Arabia, compares the House of Saud with the mafia, which writes its own laws and knows no scruples. He says that Khashoggi had been connected with the royal family for years and had been part of the system. But it is well-known that the mafia only makes lifelong contracts, says Bradley. It doesn't allow people to suddenly drop out. He says Khashoggi's situation was ultimately that of a man who tried to leave the mafia and was therefore "disposed of." Khashoggi's disappearance has triggered consternation around the world. In a joint statement on Wednesday, the G-7 group of industrialized nations called for a "thorough, credible, transparent and prompt investigation" by the Saudi government. Trump quickly dispatched Secretary of State Mike Pompeo to Riyadh and Turkey this week. The political damage "will be significant," says former FBI agent Ali Soufan. MBS had invited the elite of the international financial world to a major conference in Riyadh next week dubbed "Davos in the Desert," but International Monetary Fund Director Christine Lagarde, the heads of the major banks HSBC, Standard Chartered and Credit Suisse and other business leaders have all now canceled. The finance ministers of France and Britain have also announced they will not go as has the U.S. treasury secretary. So far, no conclusive evidence pertaining to the horrific crime at the consulate has emerged. As of Thursday night, the Turkish government hadn't made any of the allegedly compromising material from the consulate public, having only leaked individual details about the case. One reason is likely that the Turkish government secretly bugged the consulate, which enabled it to obtain the alleged audio recordings in the first place. Going public with the recordings would be tantamount to admitting that Ankara had flouted diplomatic tradition. Nevertheless, circumstantial evidence pointing to murder is mounting. The Khashoggi story got its start on Friday, Sept. 28, when the journalist first visited the Saudi Arabian Consulate to pick up some documents. He received a warm welcome and was told he should return the following week and that the papers would be ready for him then. A consular officer then called him over the weekend to set an appointment for Tuesday, Oct. 2. The Saudi consulate is located in the Levent business district in northern Istanbul, a simple building bearing little resemblance to the kinds of palaces Saudi Arabia maintains in other cities. Trees grow in the courtyard and bank towers rise into the sky in the background. Surveillance cameras operated by the Turkish authorities recorded Khashoggi as he entered the consulate at 1:14 p.m. on Oct. 2. He knew he was taking a risk by going there, but he didn't think it was a big one. Khashoggi had spoken openly with acquaintances about his fears of being kidnapped. U.S. intelligence agencies had only recently intercepted a conversation in which Saudi Arabian officials discussed kidnapping the journalist on behalf of Crown Prince Mohammed bin Salman. But Khashoggi felt safe in Istanbul, in part because he was friends with President Recep Tayyip Erdogan. Mohammed bin Salman, he confided to a Turkish friend, would surely shy away from clashing with the Turkish president. Istanbul has developed into a magnet for dissidents fleeing from the Arab world. Free Syrian Army rebels are present in the city as are opponents of the military junta in Egypt, former government ministers from Yemen and ex-parliamentarians from Kuwait. "Istanbul is the last enclave of the Arab Spring," says Ayman Nour, an Egyptian opposition politician and former adviser to ex-president and Muslim Brother Mohamed Morsi. Nour also lives in exile in Istanbul. Khashoggi welcomed the Arab Spring. In an August column for the Washington Post, he also defended the Muslim Brotherhood. "The eradication of the Muslim Brotherhood is nothing less than an abolition of democracy and a guarantee that Arabs will continue living under authoritarian and corrupt regimes," he wrote. He also positioned himself against Crown Prince Mohammed bin Salman, who views the Muslim Brotherhood as a threat and, together with Egypt and the United Arab Emirates, is campaigning for the Europeans and the Americans to classify the movement as a terrorist group. According to a report on the American news site The Daily Beast, Khashoggi had planned to set up a lobby group to unite champions of the Arab Spring scattered around the world. In Istanbul, he met regularly with Morsi consultant Nour, a longtime friend. Khashoggi also reportedly intended to join the Arab television station Al-Sharq, which has close ties to the Muslim Brotherhood. All these could have been factors behind his death. In May, Khashoggi met the Turkish doctoral student Hatice Cengiz at a conference. From that point on, he began commuting between McLean, Virginia, where he has been a resident since 2017, and Istanbul. He bought an apartment in the city, which he furnished together with Cengiz. The two had planned to get married on Oct. 3. Under Turkish law, couples must prove that they are not already married elsewhere with documents from their home country before they can wed. That's why Khashoggi turned to the Saudi Arabian Consulate in Istanbul. Informants close to Crown Prince Mohammed bin Salman's circle assured him that he had nothing to fear, says Turan Kislakci, the chairman of the Turkish-Arab Media Association and a friend of Khashoggi. Nevertheless, Khashoggi left his two phones with his fiancée before entering the consulate that day. She waited for him outside the door. Cengiz was to notify Yasin Aktay, an Erdogan adviser the couple were friends with, in the event of an emergency. According to statements made by investigators, forensic expert Tubaigy and the suspected death squad from Riyadh were waiting for Khashoggi at the consulate. The killers attacked immediately after he entered the building. Citing the transcripts of the illicit audio recordings, Turkish sources say that Saudi Consul Mohammad al-Otaibi objected. "Do this outside. You will get me in trouble," Turkish police quoted the diplomat as saying. "If you want to live when you come back to Arabia, shut up," one of the killers retorted. Local Turkish staff at the consulate had been given the day off at short notice. According to statements made by Turkish officials, the men left the consulate in six vehicles at 3:08 p.m. Two further vehicles made their way to the consul general's residence, which is located almost 200 meters (650 feet) from the consulate. One of the two vehicles, the investigators suspect, contained Khashoggi's dismembered body. At this point, Hatice Cengiz was still waiting for her fiancé. She asked a security guard at the entrance about him. "There is nobody in here," the man answered. When Khashoggi still hadn't reappeared by midnight, she informed Aktay, the Erdogan adviser, as well as the police. "I am going through a difficult, painful time," she told DER SPIEGEL on the phone this week. "I don't feel very alive anymore." It took some time for details in the case to become public. At first, there was speculation that Khashoggi had been kidnapped. He wouldn't have been the first journalist MBS had made disappear. According to Reporters Without Borders, at least 15 journalists and bloggers have disappeared since September 2017. Their arrests were often only announced months later. On Saturday, Oct. 6, Reuters reported that Turkish police were assuming that Khashoggi had been murdered in the consulate. Aktay confirmed this suspicion indirectly by saying the Turkish government's investigators had "wide-ranging knowledge." Erdogan has had his authorities feed the media almost daily with new information, without speaking himself in any depth about the investigation. It appeared he had adopted that approach in an effort to gain support from the West. "The information turned the case into an international issue," presidential adviser Aktay told DER SPIEGEL. The relationship between Turkey and Saudi Arabia had already been tense before the journalist's disappearance, with both sides fighting for influence in the Middle East. Ankara supports the Muslim Brotherhood, which is classified as a terror group by Riyadh. And during the conflict between Saudi Arabia and Qatar, Erdogan sided with the emirate. Mohammed bin Salman has described Turkey as being part of a "triangle of evil." Erdogan, meanwhile, likes to portray himself as the patron saint of pious Muslims. Khashoggi's suspected murder must provoke and anger him, because it makes him look weak, as if he can't ensure people's safety in his own country. Observers suspect Erdogan will now want to force Saudi Arabia to make geopolitical concessions in the region -- in the Qatar conflict, for example. It's also possible that Ankara will demand money from Riyadh to help the battered Turkish economy. "We can offer Mohammed bin Salman a way out of this affair, or place further pressure on him in the form of additional revelations," says one Turkish government politician. "The question is, how much is the prince's reputation worth to him?" If the sound recordings do exist -- and there is much suggesting that they do -- they will be Erdogan's bargaining chip. With them, he can lead the Saudis around the Arab world by the nose. A killing caught on audio, broadcast across the world, would have devastating consequences. So far, the Turkish government's strategy seems to be working. Saudi Arabia allowed a Turkish delegation to inspect the consulate on Monday evening. A few hours before the inspection, however, a cleaning crew arrived with mops. The workers cleaned the alleged crime scene. Painters also reportedly came to paint the rooms. It's possible that Tubaigy might have been fast, assuming he was involved, but that he didn't do very clean work. An adult body holds five to six liters of blood, and Tubaigy had a saw but no dissecting table. During the early morning hours on Thursday, Turkish investigators also searched the consul general's residence. There had been suspicions the killers might have buried Khashoggi's dismembered corpse in the yard. But on Thursday evening, it was also considered possible that the men from Riyadh had buried Khashoggi in an Istanbul forest. Erdogan himself suggested that "poisonous substances" had possibly been found in the consulate. The consul general, meanwhile, has left Turkey with his family. He is to be interrogated in Riyadh now, which will be more pleasant for MBS than if the Turks were to question him. A Shift in Tenor in Riyadh? The Saudi government has apparently recognized that it isn't going to get anywhere with its story that Khashoggi left the consulate after a few hours. King Salman has since ordered an internal investigation. Media reports suggest he is considering passing responsibility for the murder to lower-ranking officials to take his son, Crown Prince Mohammad bin Salman, out of the line of fire. In Riyadh, sources say that General Ahmed al-Asiri, an adviser to the crown prince and deputy chief of the intelligence service, could be made into a sacrificial pawn. It's also possible that the king might transfer foreign and security policy responsibilities to Salman's brother Khalid, who is currently serving as the Saudi ambassador to Washington. Whatever the case, he got recalled to Riyadh as the Khashoggi affair unfolded. Many people in the West had been hopeful about MBS. He had portrayed himself as a reformer since he had, in practice, taken over power from his father. He has limited the powers of the religious police, which had long been busting women for wearing makeup or traveling alone in order to punish them or hand them back to their husbands or fathers. He lifted the ban on concerts and cinema in Saudi Arabia. And, since June, women have been allowed to drive cars. At the same time, repression against critics has also increased under MBS's leadership. Last fall, the regime had thousands of dissidents arrested, some of whom are facing the death penalty. In August, the kingdom reacted so angrily to a tweet about its human rights record by the Canadian Foreign Ministry that it ejected the Canadian ambassador, canceled flights to Toronto by the Saudi state airline and forced the approximately 8,300 Saudi students studying in Canada to continue their studies elsewhere. "MBS is acting like a spoiled child who suddenly has a dictator's powers in his hands," Loulouwa al-Rachid, co-director of the Carnegie Middle East Center in Beirut, told DER SPIEGEL. Her judgement is harsh and not impartial, but very knowledgeable, given that she is speaking about a relative. The Rachids were until 1921 the competing dynasty over the rule in Najd, the geographical heart of what subsequently became Saudi Arabia, and were ultimately beaten and married into the victorious family. As a child, she played with the princes, and now she lives in exile in Beirut and Paris. One needs to understand, she says, how MBS grew up. Unlike his brothers, she points out, he never studied outside of the country. She asserts that the crown prince is also violating a self-perception of Saudi rulers. "None of the kings were feared. Brutality wasn't their trademark. MBS wants to change that. He wants to be feared, like Saddam Hussein once did in Iraq," says al-Rachid. She says he has taken power from the ministers and the provincial governors of the old elite and brought forward an entourage from the second and third ranks. "There is no corrective anymore that can hold him back." Like many experts, al-Rachid believes it is unlikely the alleged secret operation in Istanbul took place without Mohammed bin Salman's knowledge -- or even against his will. "Why did the Saudis send officials -- including a forensic doctor -- to Istanbul if they only wanted to interrogate Khashoggi?" asks a Turkish investigator. "How could they kill Khashoggi within two hours and dispose of his body if they hadn't planned it?" The Turkish newspaper Sabah, which is considered close to the government and often has good sourcing from its highest ranks, has published a list with the names and photos of the 15 men who arrived in Istanbul from Riyadh on Oct. 2. Aside from Tubaigy, the forensic doctor, 11 have connections to the Saudi security apparatus. Most importantly, many of them belong to circles close to Crown Prince Mohammed bin Salman. That makes it almost impossible to take him out of the line of fire. The alleged death squad was comprised of younger security guards for the crown prince. Older security officers were placed alongside them, two of whom are believed to have worked directly in the Crown prince's office, and one of whom accompanied the crown prince on a trip abroad this year. The No. 4 person on the Sabah list, a professional named Muhammad Saad Al-Zahrani, was among the bodyguards. He was visible on Saudi state television in April during a reception of Yemeni tribal leaders only a few meters away from MBS, as a bodyguard should be. Thaar Ghaleb al-Harbi, No. 10 on the list, could be seen standing directly behind him. One year ago, Mohammed bin Salman promoted him to lieutenant as thanks for his courage in defending the crown prince's palace in Jeddah against an attacker. According to reporting by The Washington Post, the sixth person on the list, Khalid Alotaibi, is also a member of the royal bodyguards. The New York Times has identified No. 7, Abdulaziz Mohammed al-Hawsawi as one of the crown prince's bodyguards who accompanies him during trips. No. 8, Waleed Abdullah Alshehri is a member of the Saudi Arabian air force and was personally promoted to major by Mohammed bin Salman in 2017. The older security officials who traveled from Riyadh to Istanbul include Maher Abdulaziz Mutreb, who was accredited as a Saudi diplomat in London until 2007. Ghanim al-Dosari, a Saudi dissident living in London, is certain Mutreb worked in London for the Saudi secret service. Mutreb accompanied Mohammed bin Salman to Europe and the U.S. this year. He may now be the crown prince's personal security official. On Thursday, the Turkish daily Sabah published photos that allegedly show Mutreb in front of the consulate and the consul general's residence. The remaining names on the Sabah list have not yet been clearly identified. A team of international researchers using publicly available sources assumes they are also members of the Saudi secret service. Two of them supposedly report directly to the crown prince. On social media, at least, there are clues connecting them directly to Mohammed bin Salman's office -- one as a member of the secret service and another as chief of staff for the crown prince. Up until a few days ago, most of the members of the suspected killing squad had Facebook accounts. In total, nine team members had profiles. They proudly described themselves as members of the military. It is impossible to prove these profiles really belonged to the people being searched for, but now all of them have been deleted. It's a bit strange. Whatever these purported tourists did in Istanbul, they are the prince's men. Riyadh is portraying rumors about Khashoggi's murder as a conspiracy against the Saudi kingdom. The state channel Al Arabiya aired a special 40-minute program with the title: "What did Qatar have to do with Khashoggi's disappearance?" The Twitter hashtag "tweet your love for Saudi Arabia" has also been trending. Users tweeted photos of the crown prince, the national flag and sentences like: "We are proud, we need nobody. But the entire world needs us." Outside the country, the usual suspects have thus far come forward in support of Saudi Arabia: the United Arab Emirates and Egypt. UAE's foreign minister, Anwar Gargash, spoke of a "malicious campaign." The Egyptian Foreign Ministry, meanwhile, complained of attempts to "instrumentalize the case politically against Saudi Arabia." It is unclear whether Saudi Arabia's Arab allies were informed about Khashoggi's disappearance. It's notable that both Saudi jets didn't fly directly back to Riyadh, but made overnight detours -- one to Cairo and the other to Dubai -- as if something had to be explained to the intelligence services there. The Europeans have so far held back in their comments. Although Germany, France and Britain have called for "credible investigations" by Riyadh in a joint statement, they don't want to talk about consequences until the Saudi government has, as promised, provided an explanation. For the German government, the Khashoggi case comes at the most inopportune time imaginable. Just a month ago on the sidelines of the UN General Assembly, Foreign Minister Heiko Maas announced, alongside his Saudi counterpart Adel al-Jubeir, a return to normal diplomatic relations. Maas said he regretted the "misunderstandings" that had emerged because of his predecessor, Sigmar Gabriel. Gabriel had accused MBS of "foreign policy adventures," because he had held Lebanese Prime Minister Hariri in Riyadh for several days in order to convince him to take a critical stance toward Iran. In response, Saudi Arabia temporarily recalled its ambassador from Berlin, which placed a burden on the economic relationship between the two countries. When Maas took over at the Foreign Ministry, Siemens and Daimler, among others, pushed him to patch up the relationship. Maas worked feverishly at reconciliation. He defended, among other things, the delivery of patrol boats and a radar system to the kingdom. Weapons deliveries to Saudi Arabia are generally controversial in Germany's parliament, the Bundestag, but particularly since Saudi Arabia began bombing Yemen. Maas has now canceled a planned meeting with Mohammed bin Salman in Riyadh in October. If the suspicion should grow that the Saudi regime ordered Khashoggi's murder, Berlin will face further pressure to impose sanctions on Riyadh. "A politically motivated murder would be more than just being adventurous. These kinds of violent acts are something that we Germans know from the darkest days of the Cold War," says SPD politician Sigmar Gabriel. "The West, and especially Europe, cannot look the other way out of fear of political or economic threats." Ultimately, the question of whether MBS will get away more or less lightly with the suspected murder largely hinges on the response from the United States. Thus far, Trump has reacted unpredictably to the Khashoggi case. He threatened Riyadh with "severe punishment" in an interview with CBS, only to later profess agreement with the Saudi depiction of events, arguing that unknown "rogue killers" could be responsible for Khashoggi's disappearance. On Thursday, he admitted that Khashoggi seemed to be dead, and that the whole thing is "bad, bad stuff." Trump sees Mohammed bin Salman as a partner who could help the U.S. solve some of the region's most pressing problems, particularly when it comes to Iran. This approach is consistent with Trump's binary, friend-or-foe view of the world: MBS is good, Tehran is bad. Trump has high hopes that MBS will make peace in the Middle East a possibility, guarantee cheap oil, invest billions in the U.S. economy and buy American tanks and warplanes. And he would be a reliable ally in the conflict with Iran. In return, Trump is determined to guarantee Saudi Arabia's security, to intensify the conflict with Iran and completely ignore the bloody war in neighboring Yemen. Trump's soft spot for autocrats is well-known. He has high regard for North Korean ruler Kim Jong Un, Russian President Vladimir Putin and Rodrigo Duterte of the Philippines. When it comes to Saudi Arabia, Trump's business inclinations match up with political exigency. Trump knows from his own previous business dealings just how wealthy the Saudi royal family is. And those former business relationships could now become a problem for him on the international stage. On at least two separate occasions, investments from Saudi Arabia saved him when he badly needed cash. In 1991, Saudi Prince Alwaleed Bin Talal bought the yacht Trump Princess. And in 1995, Bin Talal made another purchase from Trump, this time the Plaza Hotel in New York for $325 million. More money came from the Saudis the next year: One floor of the Trump World Tower belongs to them. During his presidential campaign, Trump said: "Saudi Arabia, I get along with all of them. They buy apartments from me. They spend $40 million, $50 million. Am I supposed to dislike them? I like them very much." Once he became president, the roles flipped, with Saudi envoys hoping to reap the benefits of proximity to the White House. Their primary focus was a law related to the Sept. 11, 2001, terror attacks -- a law that Riyadh finds objectionable. The Justice Against Sponsors of Terrorism Act was passed by Congress in September 2016 over President Barack Obama's veto. It makes it possible for those injured or the family members of those killed in the 9/11 attacks to sue Saudi Arabia -- a judicial, diplomatic and political catastrophe from the perspective of Saudi Arabia. The plaintiffs' lawyers claim that employees of the Saudi government aided the al-Qaida terrorists involved in the attack. Riyadh, though, has consistently denied all such accusations. In the spring of this year, a judge in New York issued a ruling allowing the lawsuits against Saudi Arabia to proceed. From the very beginning, the House of Saud's strategy has focused on getting the law overturned. They have engaged lobbyists in the effort, along with a Washington, D.C., law firm -- and spent millions. More than anything, though, the royal family hopes its relationship with the president and his family will prove helpful -- particularly the bond with Trump's son-in-law Jared Kushner. Kushner is one of Trump's networkers in the Middle East. Since Trump's election, he has become closer to Mohammed bin Salman and has established regular contact with Riyadh, some of which has taken place without the knowledge of the U.S. State Department. Kushner and Mohammed bin Salman have a lot in common. They are roughly the same age, both were born with a silver spoon in their mouths and are comfortable around wealth and power. Both are also politically ambitious, and belong to a generation of young businessmen and decision-makers who feel at home in the world of technology. During a visit by Kushner to Riyadh in October 2017, they supposedly stayed up until 4 a.m. exchanging ideas. CNN chose "A Tale of Two Princes" as the headline for a March commentary on their relationship. Kushner's focus is advancing the cause of peace in the Middle East while Mohammed bin Salman's is establishing connections with U.S. investors who could support his vision of a reformed Saudi Arabia that is no longer dependent on oil. But the Saudi prince may have the upper hand in the relationship: Bin Salman is said to have told confidants that he has Kushner "in his pocket." The Khashoggi case has shaken the trust between the two. Kushner's father-in-law remains dedicated to keeping Saudi Arabia as a partner -- primarily due to the money, the billion-dollar arms contracts -- as he has repeatedly emphasized. But several prominent Republicans have voiced their concerns publicly. Senator Lindsey Graham, an influential Trump ally, has gone so far as to demand far-reaching sanctions. Vice President Mike Pence has said the perpetrators must be brought to justice. If the U.S. president is forced to back away from Saudi Arabia, it would essentially mark the failure of his entire Middle East policy thus far. He needs the king and he needs the crown prince even more. On Tuesday, he stressed the legal standard of innocent until proven guilty -- likely an attempt to buy time in the hopes that the current storm will soon die down. Secretary of State Pompeo has advised Trump to give the House of Saud a few more days to present results from its investigation. For Trump, it is helpful that, with the mid-term elections just around the corner, Congress is not currently in session. That means that even if sanctions are being considered, they won't come quickly. Now, it remains to be seen how good the next story is that Saudi Arabia comes up with. Tourists with bone cutters? That's a tale nobody in the West is buying. The rich really are different after all. That was the message this week as US banks and brokerages released their latest quarterly earnings. Where lending to consumers and companies is now moderating, credit to the financial elite remains strong. JPMorgan reported 12 per cent year-on-year loan growth for its wealth and asset management division, while the comparable division at Morgan Stanley reported a 7 per cent gain. Thanks to the rapid growth in private client lending, JPMorgan has now lent out almost as much to a small number of its elite customers as it has to its millions of cardholders. To put that into perspective, just nine years ago the bank had $5 out to cardholders for every $1 lent to its private clients. Where the availability of credit to Main Street has been limited — if not reduced — since the housing crisis a decade ago, for those on Easy Street it has never been better. The strong growth in private credit reflects the relative confidence of the wealthy and their lenders. With widespread certainty that all this debt can be repaid, the risk of a big surprise is high. In the financial markets, universally believed truths have a funny way of being proved false. Ten years ago, banks learnt that the hard way when homeowners showed they do not always pay their mortgages first. While the volume of high-net-worth credit is not a systemic risk, as housing credit was, losses are likely to be far greater than either the lenders or their regulators imagine. Loan portfolios are growing rapidly, on the back of a strong economy and soaring markets. But when those conditions reverse, so too will loan quality. The banks, though, will not be the only ones to suffer. Consider how much the wealthy have driven the post-crisis recovery. In New York, for example, there is now a cluster of pencil-thin, super-tall skyscrapers at the southern end of Central Park, known as Billionaires’ Row, that did not exist before the crisis. In Los Angeles, there is a 157-acre residential property for sale for $1bn. While those are extreme examples, the luxury market in this economic cycle has been especially strong. Fuelled by abundant low-cost debt, the wealthy have driven markets in real estate, watercraft, art and other collectibles to record prices. Then there is the stock market itself. “Investments” represent the ultimate “luxury goods”. Our demand for investments increase more than proportionally as our income rises — and for the very wealthy, it does so dramatically. Net worth, like yacht length, is a measuring tool of status. The danger is that no one will want stocks at the bottom of the next crisis, just as no one will want big homes and big boats. Just as consumers no longer saw their homes as investments after the banking crisis, the wealthy will not see stocks as a viable investment either. For the individuals and lenders now caught up in the swirling virtuous cycle of ever higher asset values, the notion of a simultaneous collapse of all luxury goods markets must seem laughable. The dramatic growth in outstanding loans during the past decade, however, suggests that such an outcome is not just likely, but highly probable. Credit weaves both inter-connectedness and interdependence. When the drop comes, all will descend at once. A decade ago, Main Street had its bubble burst. But the rich did not. The Federal Reserve and other central banks stepped in to save the financial system, and by extension, the wealthy as well. Ironically, because of that, credit has since flowed not only disproportionately to the wealthy, but now to excess. While the rich may be different, one thing is certain: when economies slow, no one is immune from the adverse consequences of over-indebtedness. Hedge fund managers sit at the top of the financial world’s food chain. They’re generally seen as the smartest money managers, and their companies have the most flexibility to pursue new opportunities. The result is supposed to be the best possible returns – for clients who can afford the high fees. But lately things haven’t worked out that way. Hedge fund managers appear baffled by the behavior of stocks, bonds and pretty much everything else, as time-tested strategies fail and brand-name managers report terrible results, in a growing number of cases throwing in the towel, returning their investors’ money and riding off into the sunset. To take one of many recent examples, Cerrano Capital LLC, according to the Wall Street Journal “a $700 million hedge fund backed by some of the industry’s biggest names,” announced its closure after less than a year in business. Its initial results were lackluster and the manager reportedly tired of the cold reception he received from potential investors. A higher-profile mess is David Einhorn’s Greenlight Capital, which through August of this year was down 25% versus an 8.5% gain for the boring old S&P 500 – an index that can be owned via ETFs for vanishingly low fees. Then came October’s brutal takedown of tech and finance stocks, which you’d think would provide both vindication and quick profits for the hedge funds that had previously lost big by ignoring and/or shorting those obviously-overpriced sectors. Daniel Loeb’s Third Point down 6%, or roughly $1 billion in October. On October 24 alone, long/short equity hedge funds lost an average of 1.44%. Why is this happening and why should anyone care? First and least bad, the number of hedge funds has exploded in the past couple of decades. But the number of extraordinary money managers didn’t increase commensurately. So a rising supply produced declining quality, which is now showing up in unfavorable results. That’s no big deal. All markets experience periodic gluts and manage them via die-offs which bring things back into balance. This is healthy. Second and emphatically not healthy, the world’s governments have reacted to past financial crises by creating trillions of dollars of new currency and buying up financial assets to protect the big banks that finance incumbents’ reelection campaigns and to generate a “wealth effect” to maintain economic growth. Why is this bad? Because governments and central banks don’t discriminate. They just buy representative assets across the board, pushing prices of securities up in lock-step. This produces rising “markets” but makes old relationships between price, earnings, yield, cash flow, etc., obsolete. Put another way, if everything is going up in concert, then investment models based on some securities being more attractive than others stop working. Combine an influx of new, less-competent managers with the failure of the strategies that used to work and you get today’s hedge fund universe, full of former winners who are now reduced to trend following to keep their clients. And who will be absolutely crushed if Apple, Google, Facebook, et al return to their intrinsic values 50-or-so percent below current prices. By why is this bad? Because capitalism operates via prices, which tell people with capital how to allocated it (hence the term capitalism). Cripple the price signaling mechanism by indiscriminately pushing up prices within entire asset classes, and capital is allocated randomly rather than efficiently. Projects that shouldn’t be financed go ahead, and then eventually fail. Since the capital market pricing mechanism has been perverted not just here but pretty much everywhere, it’s safe to assume that the amount of misallocated capital in the world is at a record high. Which means the failures when they come will be many, varied, and huge. Hedge funds, viewed this way, are canaries in the financial coal mine, their failures pointing towards much bigger ones to come. So long as Washington endeavors to counter Iran, it will have to stomach the more unsavory aspects of its relationship with Riyadh. The grisly murder and dismemberment of Jamal Khashoggi has cast a garish light on what is business as usual in the Middle East. In the U.S., many are aghast that their government is working with a country capable of such an act, and specifically with a leader (Crown Prince Mohammed bin Salman) who could be so reckless and cruel. In Saudi Arabia, there is a degree of consternation as to why Khashoggi’s death has set off such a firestorm, considering Riyadh’s dutiful record as key U.S. ally in the region for decades, and even more so in the past two years. The simple fact is that Washington’s current strategy in the Middle East leaves the U.S. with only unsavory choices, and until that strategy changes, it’s stuck with the devil it knows. Riyadh, meanwhile, doesn’t have much of a choice – it’s been stuck with the devil it can’t avoid since 1945. Fruitful though the partnership has been since Franklin D. Roosevelt and King Ibn Saud shared a Valentine’s Day meal on the USS Murphy that year, the fundamentals of the relationship were fraying long before the world had ever heard of Jamal Khashoggi. It was the Obama administration that first sought to distance the U.S. from its long-standing ally, but the Trump administration reversed that decision in 2017. Under President Donald Trump, U.S. strategy in the Middle East is animated by three goals: defeating Islamist extremism, rolling back Iranian influence across the region (regime change would be ideal), and inducing its allies there to do a better job of doing both. By contrast, the Obama administration was more concerned with extricating the U.S. from direct involvement in the Middle East and redeploying U.S. attention and assets to Asia. The emergence of the Islamic State in 2014 made this shift all the more imperative for the Obama administration, which sought to protect U.S. interests by creating a self-regulating balance of power at the expense of traditional U.S. allies in the region. In that sense, it is not only the Trump administration’s goals that are different: The tactics have changed as well. Since 2017, Washington has sought not a balance of power but an alliance structure that would destroy U.S. enemies. The most important player in that strategy was, and remains, the embattled Kingdom of Saudi Arabia. Saudi Arabia’s struggles run far deeper than the bad publicity it’s received in the fallout of Khashoggi’s murder. Since the turn of the century, its position as regional power has come under threat from two rising powers: Turkey and Iran. This, of course, was not always the case. In the early 1990s, Saudi Arabia had a larger gross domestic product than both countries, its economy fueled almost exclusively by hydrocarbons. Iran was coming off a bloody and horribly destructive eight-year war with Iraq, and Turkey had to deal with an economic crisis and a military coup. The post-Cold War world looked good from Riyadh’s point of view. Since 2000, however, Saudi Arabia has lost considerable ground. The Turkish economy is now roughly 25 percent larger than the Saudi economy, and while the Iranian economy remains smaller, its domestic industrial plant allows it to produce weapons at home – something Saudi Arabia, despite all its advanced weapons, cannot do. By falling to parity economically, Saudi Arabia lost its only claim to regional power status. In terms of both comprehensive military forces and population, the kingdom is a second-rate power compared to Turkey and Iran. In addition, the resource that fueled the explosion of the Saudi economy in the second half of the 20th century has become the kingdom’s Achilles’ heel. Saudi Arabia is so hopelessly dependent on oil for its economy that 50 percent of its GDP comes from the oil and gas sector. 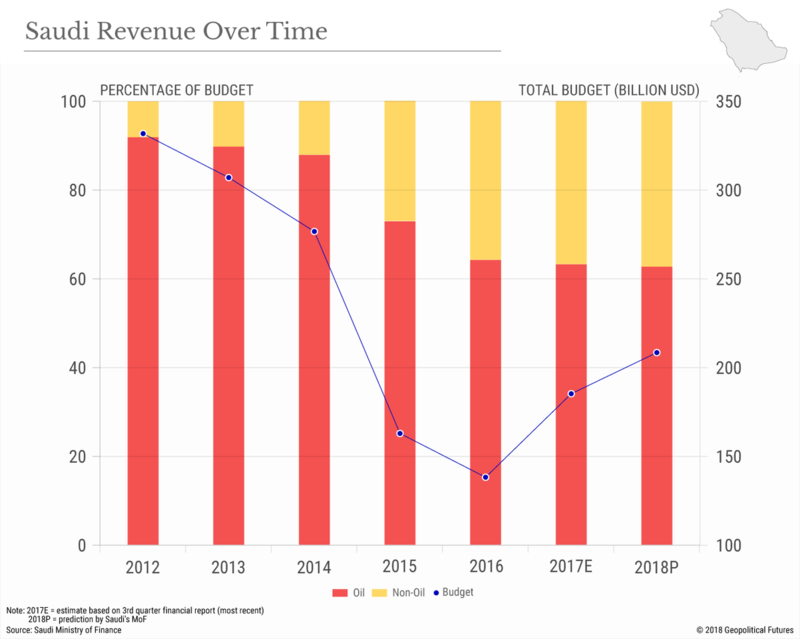 The 2014 collapse of oil prices created a $100 billion deficit in the Saudi budget. Even with the bump in oil prices in recent months, the Saudi economy is still running a deficit of roughly 7 percent of GDP (about $50 billion.) Saudi Arabia’s formidable foreign exchange reserves, which reached a high of $737 billion in 2014, declined to $506 billion in August. The timing of the decline couldn’t have been worse. Riyadh was pouring money into the coffers of allies and proxy groups throughout the Middle East, the ultimate purpose of which was to spoil Turkish and Iranian regional ambitions. When the price of oil dropped, the Saudis didn’t just enter a period of economic uncertainty: They lost the one real weapon they had to push back against their regional competitors. The concomitant rise of Crown Prince Mohammed bin Salman – who has come under fire for his alleged orchestration of Khashoggi’s death – and the reform program that is his hallmark has to be understood in this context. The crisis of 2014 brought home the idea that change was necessary if Saudi Arabia was to survive. There were a variety of ideas of what change might portend, but they stopped mattering once MBS executed his bloodless palace coup, consolidated power and took his place as next in line to the throne. His vision of Saudi Arabia’s future, a fabulously ambitious program called Vision 2030, means to transform the Arabian desert into an Arab Silicon Valley. In executing this policy, MBS has broken virtually every economic, political and institutional precedent the country has ever set. There is no better example of how jarring MBS’ reforms have been than the role religion has played in his consolidation of power – or, more accurately, the role it hasn’t played. The Saudi regime is a marriage between tribal loyalty and Wahhabism, an austere and conservative interpretation of Sunni Islam. It doesn’t leave room for any other competing religious ideology. Historically, the biggest threat to the Saudi monarchy has been the 10-15 percent Shiite minority that resides in the kingdom’s eastern reaches – where most of its oil is located. But under MBS’ rule, Saudi security forces have stopped at nothing to keep the Shiites in check. They have also arrested and sentenced to death Sunni clerics associated with the Sahwa (“Awakening”) movement. The movement bears a theological and ideological resemblance to the Muslim Brotherhood, which was outlawed in Saudi Arabia decades ago because it preaches a different kind of relationship between mosque and state than Wahhabism – and thus constitutes a direct threat to the ruling family and the religious foundation on which its legitimacy rests. This partly explains why Saudi intelligence officials viewed Khashoggi as such a menace. In an April 2018 article in the New Yorker, Khashoggi was quoted as saying, “most of the clerics [MBS] is arresting are not the hard-line clerics, but the reformers – because they are popular.” The clerics MBS is arrested are indeed reformers, but most Westerners wouldn’t agree with Khashoggi that they are “not hard-line.” Those detained adhere more closely to what the Muslim Brotherhood practices than what Wahhabist clerics practice. Indeed, two recently arrested clerics – Safar al Hawali and Salman al-Ouda – were routinely cited by Osama bin Laden in his sermons against the United States in the 1990s. In other words, Khashoggi’s ties and sympathies to this form of political Islam posed a direct threat to the legitimacy of the Saudi monarchy, which believes it can’t concede an inch to organizations such as the Muslim Brotherhood. 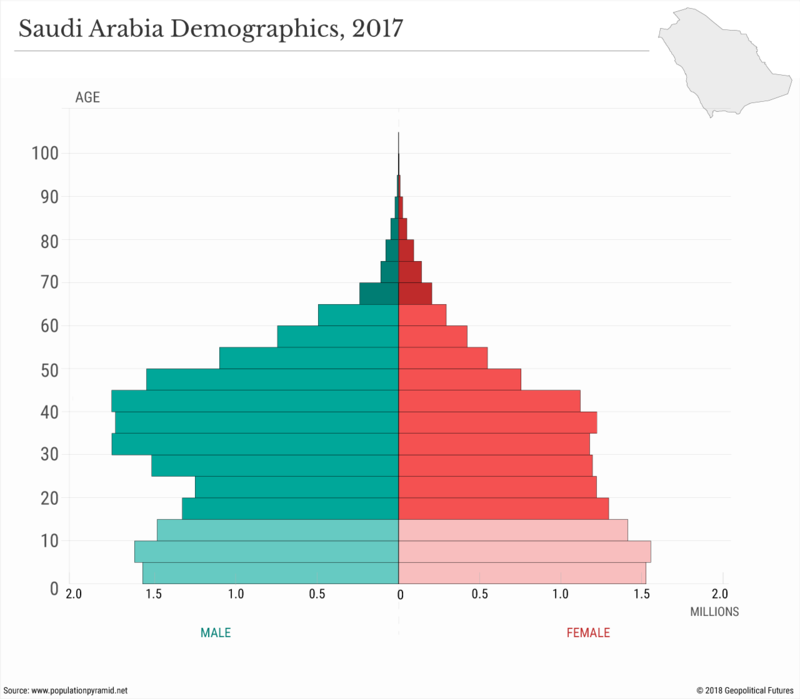 After all, nearly 70 percent of the population of Saudi Arabia is under 30 years old with few professional prospects and no meaningful national identity. There is no better recruiting ground in the world for potential Muslim Brotherhood converts or, more drastically, for jihadists. This is why the U.S. response to Khashoggi’s murder has been so muted (to say nothing of the Saudi-led war in Yemen, where at least 50,000 people have died and where the United Nations estimates 75 percent of the population is in need of immediate humanitarian assistance). As long as the United States’ primary goals are to destroy jihadists and Iran, Washington has no choice but to stomach less savory aspects of its alliance with Saudi Arabia. In that limited sense, the U.S. needs Saudi Arabia as much as Saudi Arabia needs the U.S. Hence the immediate dispatching of the U.S. secretary of state to Riyadh after the Khashoggi revelations and the informal presence of the U.S. treasury secretary in Saudi Arabia for this week’s “Davos in the Desert” investment conference in Riyadh. And yet, in its single-minded focus on rolling back Iranian influence and “annihilating” the Islamic State, the United States and Saudi Arabia have underestimated the other rising power that seeks to claim the mantle of leader of the Sunni Muslim world: Turkey. It’s no coincidence that Turkey is making a massive deal out of the Khashoggi murder. For years, Turkey has been slowly and methodically building political and military clout in areas Saudi Arabia considers its sphere of influence. Qatar, for example, was able to survive Riyadh’s attempts to punish it last year for being too friendly with Iran largely through help from Turkey. (Qatar also hosts a Turkish military base.) The government in Ankara, moreover, recently signed a military cooperation agreement with Kuwait, and Oman, which has always tried to play both sides of the Saudi-Iran rivalry, appears more open to Turkish overtures than it has in the past. Perhaps most notably, the recent announcement that Jordan canceled two annexes of its peace treaty with Israel comes at the heels of months of speculation that Jordan and Turkey are also growing closer. Jordan is reportedly unhappy with Saudi Arabia’s stance toward the Palestinians, on whom the Trump administration has been far tougher than the Obama administration. On Monday, the Jordan-based Royal Islamic Strategic Studies Center even named Turkish President Recep Tayyip Erdogan the most influential Muslim in the world. Turkey is no friend to journalists; it has made a big deal of the Khashoggi murder because it sees in the reaction to his death a strategic opportunity. The Saudi government is probably not in immediate danger. King Salman and MBS have successfully centralized control of the major nodes of power in Saudi Arabia: the tribal elites, the national guard, the military, the interior ministry and the clerics. The speculation that MBS will be ditched because of Khashoggi’s murder is misplaced; King Salman has ordered a reorganization of Saudi intelligence services as a mea culpa, but he has put MBS directly in charge of the process. There may very well be a crisis of succession when King Salman, who at 82 years old may not last to see what becomes of Vision 2030, dies. MBS has positioned himself as the heir apparent, but he himself skipped a few places in the line of succession, and there’s no guarantee that someone else won’t try to do likewise. But a succession crisis is a far cry from overthrowing the current king, who still enjoys widespread loyalty. While he’s around, there is no institutional force inside the kingdom that can bring about regime change without foreign intervention or outright revolution. This is why King Salman and MBS are so skittish in general, and why they are taking no chances with dissidents like Khashoggi – or any of the numerous other Saudi officials who have been purged in recent years. All the while, Saudi Arabia will try to accomplish the impossible – a complete reorientation of its political economy in 12 years. It will probably fail. So long as Saudi Arabian oil keeps flowing, the kingdom can buy allies such as Egypt and Pakistan, and so as long as the United States remains committed to countering Iran, the Saudis can be sure that Washington will ignore its human rights abuses. Turkey is better positioned than any other country to capitalize on the friction that comes from this arrangement, and already it is moving to take advantage of the opportunity. It does not need to balance against Iran while the U.S., Israel and Saudi Arabia engage in that hard work. It can simply play the role of a beneficent power and de facto spiritual leader, the sultanate and the caliphate reborn in the 21st century. It’s ironic that Saudi Arabia and the United States have what they thought they wanted from their relationship. Iran is buckling, and the Islamic State has been crushed. What’s unclear is whether Riyadh and Washington can continue to be useful to each other now that the unintended consequences of their reinvigorated relationship have been laid bare.